Welcome to.... Aapple Muffler and Automotive! 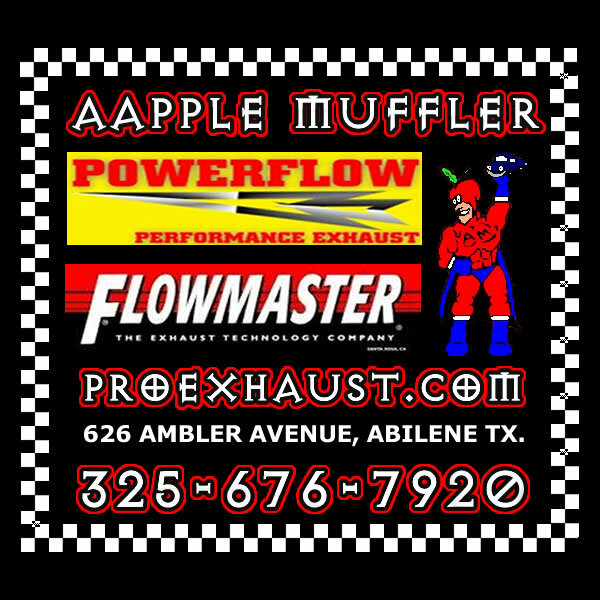 IS AAPPLE MUFFLER and AUTOMOTIVE! 28 Years, Serving Abilene and the Big Country, since 1991! Exhaust and Automotive Services from Simple Repairs to Customized Fuel Efficiency and Performance! We Provide our Customers with the Fastest and Most Professional Service in Abilene. Established in 1991 by Darrell Reynolds, Aapple Muffler and Automotive has Served the Big Country for Over 27 years! We are referred by your Friends and Family MORE than Any other Exhaust Shop in Town! We Stock The Most Popular Brands of Performance Exhaust and Catalytic Converters and Have The Largest Selection of Stainless Steel and Chrome Tips in Abilene. I have a 2002 Acura TL-S with Megan headers. I dropped off my child (young adult) at ACU and found that when I got there one of the flex joints on the collector pipe was leaking. I went by Aapple Muffler and they were able to match the flex joint, cut it out, MIG weld a new one in and had me out of there in under an hour, on a Monday morning. These guys are very good and very customer oriented. I am a mechanical engineer by trade and would recommend Aapple Muffler based on my experience. "I wouldn't use anyone else!" - George Gibson, Gibson Motors, Abilene, Tx. "The best and fastest place to take your car or truck for exhaust! "- Dave Barrett, Retired USAF, USMC- Abilene, Tx. "Superb Quality and Price!" - Ricky Lackey, Accent Coatings -Abilene, Tx. "Fast Service, Dependable and Friendly!" - Tonya Stegner, TSTC Student - Mom - Baird, Tx. "They got mad Skillz"- Dwayne "Turtle" Conner, ACU Student - Abilene, Tx. "Coach Darrell and his Crew ARE THE PRO's when it comes to Exhaust!" - Matt Hinds - HSU Baseball - Abilene, Tx. Call 676-7920 if you have questions about Exhaust.